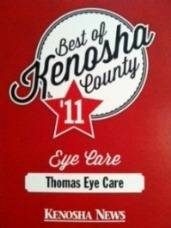 Are You Looking for an Eye Exam in Kenosha Or Pleasant Prairie, WI? We strongly encourage everyone to get a comprehensive eye exam once a year. Even if you do not have vision problems, a vision "check-up" can be critical in spotting and treating issues before they affect your vision. This is especially important for children who may not even realize that the problems they may be having in school are actually vision related. Our comprehensive eye exam is designed to provide a complete evaluation of your vision health. When our doctors conduct an eye exam, they are not only determining the proper prescription for your eyeglasses and contacts. They are also checking your eyes for common eye diseases. Some simple tests that they perform can detect the early onset of a serious eye illness such as Glaucoma. With early detection, your chances of successful treatment are much higher. Our eye doctors will also assess how well your eyes work together. Finally, your eyes can be an indicator of your overall health, and our optometrists will evaluate if there are any non-vision health issues that you should be made aware of. A vision screening can be helpful but it is by no means a substitute for an eye exam. Vision screenings are used to help identify people who are at risk for vision problems and are often performed by a school nurse or even volunteers. Even the test conducted by the clerk at the Drivers License Bureau is a form of vision screening. While these efforts can be helpful, they are not being conducted by experienced professionals who have the training to detect eye disease. A comprehensive eye examination performed by one of our Kenosha eye doctors involves careful testing of every aspect of your vision. The eye exam will give the eye doctor enough information to recommend a personal treatment plan. These exams are much more thorough than the simple vision check conducted by family physicians and pediatricians as part of a medical check-up. - An autorefractor evaluates the way an image is focused on the retina, where vision processing takes place, without the need for you to say anything. This makes autorefractors especially useful when examining people who may have difficulty with a regular ("subjective") refraction. - Cover tests, in which the eye doctor will have you focus on a small object at distance and will then cover each of your eyes, can detect even a very subtle misalignment that can interfere with your eyes working together properly (binocular vision) and cause amblyopia or "lazy eye." - Tonometry is the name for a variety of tests that can be performed to determine the pressure inside the eye. The most common method used for tonometry is the "air puff" test - where an automated instrument discharges a small burst of air to the surface of your eye. Based on your eye's resistance to the puff of air, the machine calculates the pressure inside your eye - called your intraocular pressure. Though the test itself can be startling, nothing but air touches your eye during this measurement and there's no risk of eye injury from the air puff test. There are other tests that the eye doctor may decide to perform based on his or her observations. Yet almost all of these are quick and pain free. They are, however, very important in assessing your eyes' overall health. Make An Eye Exam Appointment At Our Kenosha Eye Doctor's Office today : 262-597-2020.